This card was also a special request from my Sister-In-Law. 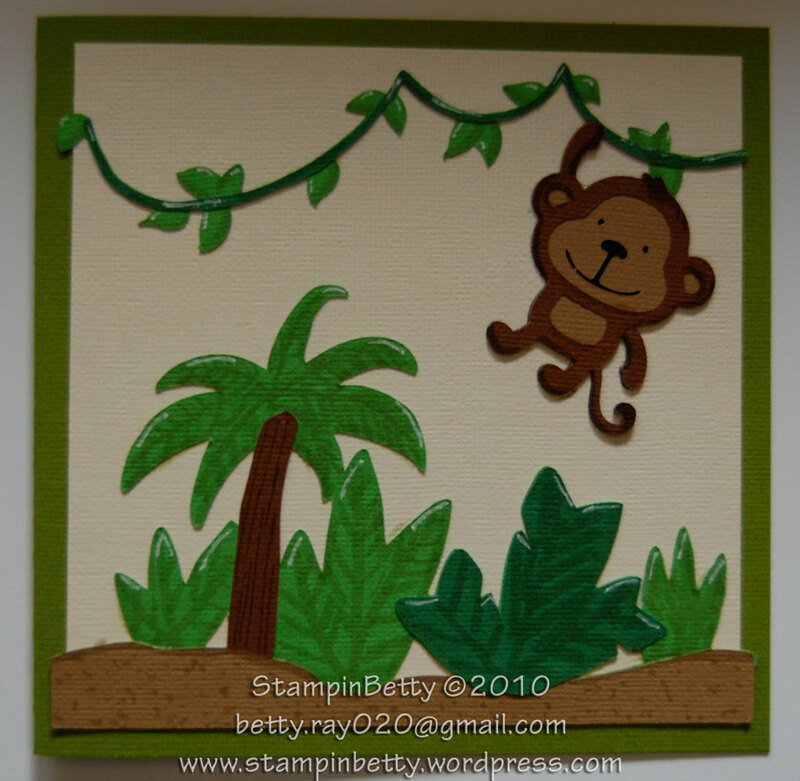 This card is for a Baby Shower where the theme is jungle animals. Another request, from the mother-to-be, is that she doesn’t want any gender stereo-type colors or themes for the baby/baby shower. They know that they are having a girl, but want to avoid the stereo-type of all pink and things like “princess” or “spoiled”. I completely understand where she is coming from….but….I can totally see myself going pink-crazy if I were to have a baby and it were a girl 🙂 I, too, don’t like those “spoiled” or “brat” type themed clothing either. Unless, of course, it were from the grandparents and it said something like “my grandma/grandpa spoil me rotten” because grandparents get to spoil their grandkids….at least that was always what my grandparents always said about all the grandkids they didn’t raise themselves. Well, I think I succeeded in no gender stereotypes on this card. When I first completed the card I didn’t really like it. It just looked so plain and 2D. 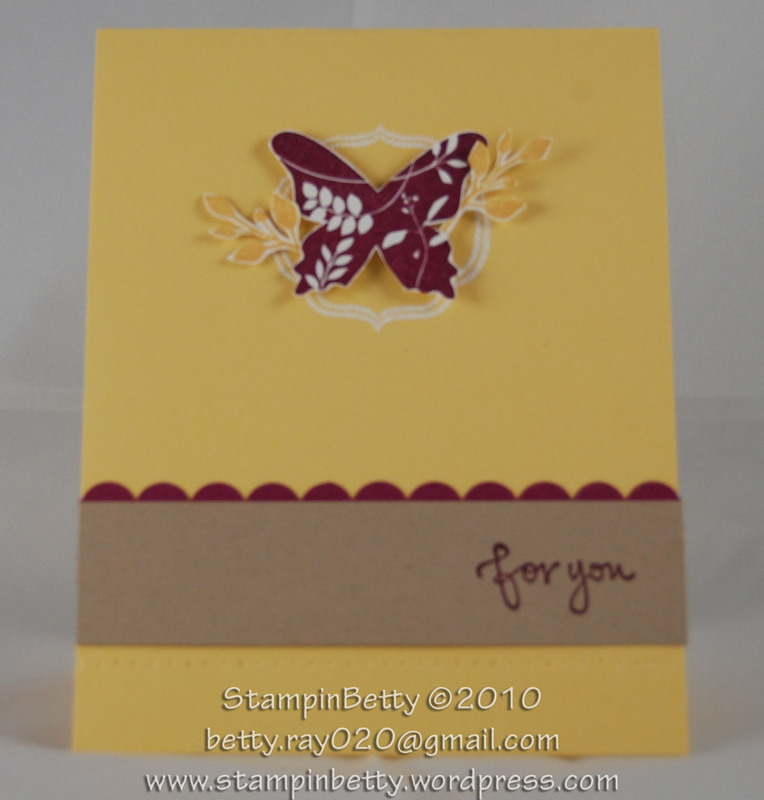 So I went back with my Stampin Write Markers and gave it more depth with shadows, and definition on the leaves and such, and then highlights from a white gel pen. It made a world of difference. The card was “OK” when it was just paper, but so much better with the added dimension gained with the markers and white pen. I have a treat for you today!!! 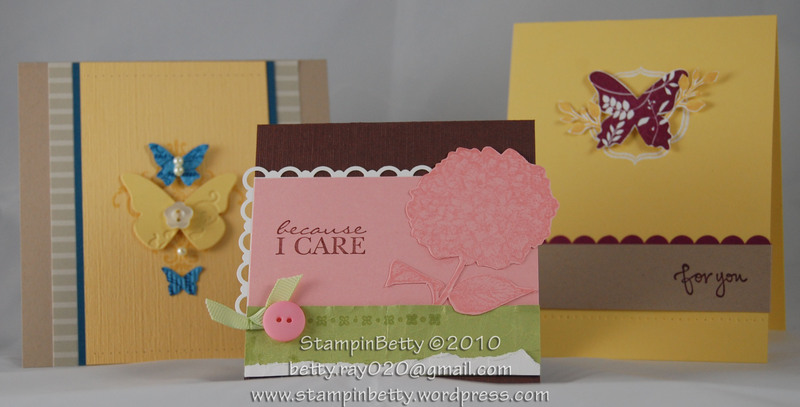 I have created 3 cards for you and they are ALL taken from the pages of the brand new 2010-2011 Stampin’ Up! Idea Book and Catalog set to release on July 1, 2010. If you have not yet ordered your catalog be sure to send me an email at betty.ray020@gmail.com. I am charging $9 for the catalog and this includes PRIORITY mailing, so really you are only paying $3-4 for you catalog (that’s less than I pay for them, but I do this in the hope that you will also choose me as your demonstrator for your purchases from the catalog.) I will be mailing these out the same day I receive my stock of them (expected to be here 1 1/2 to 2 weeks from now). So order early as I did not order that many catalogs….remember….I’m the broke crafter 🙂 After my initial stock is gone you can still order catalogs, but at the normal SU price of $9.95 plus shipping. I am also very happy to announce that my blog has been live for 1 month, and as of today I have passed 2,000 views…I’ll take that as a sign that I am doing something right 🙂 Now if I can just find some people in the area to hold workshops so I can sell some stuff the world would be a happy place. Please contact me if you would like to hold a workshop or class in your home, and you live within a 1-2 hour drive of Milwaukee. I can teach technique classes for a per person fee, which includes everyone completing the project and taking it home with them, or if you live less than 1 hour from Milwaukee we can do the traditional workshop where you gather a group of friends to make a couple simple cards, and browse the catalog (no per person fee, and the hostess receives FREE stuff based on the amount of sales at the party). 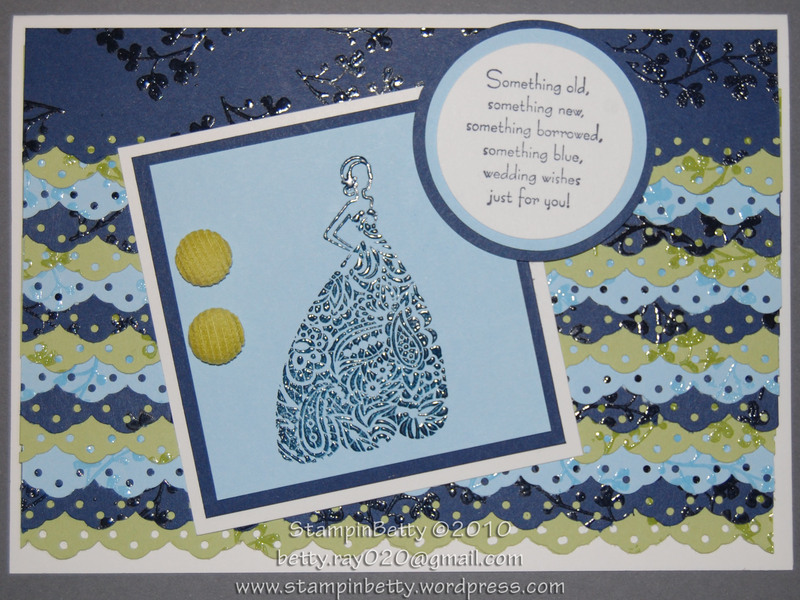 I also hold classes where you get to complete 12 cards or several scrapbook pages, and just pay a fee (this way people are not expected to browse the catalogs and buy stuff, they just get to hang out with friends, and make some really cool stuff.) Just email me if any of these ideas sound interesting to you!! betty.ray020@gmail.com (thats zero-two-zero) or just post a comment below with your email and I will contact you. Yesterday was so much fun and a total “girls” day!! First I went to an early movie with a good friend and her 2 daughters, then we went to Barnes & Noble (couldn’t we all just sit in there with a cup of coffee and browse books all day?!? ), then a late lunch at Noodles & Company, and then we all came back to my house for an evening of crafts and movies!! Too much fun. 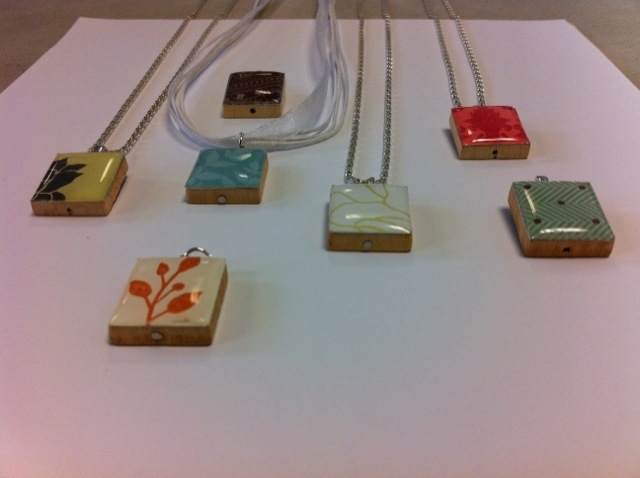 So in our all girls day I got to introduce 3 NEW people to stamping….I’m pretty sure they will be back for more. My lovely friend Tina has told me over and over again how she just isn’t into crafts and is not an artsy person at all. I had already told her daughters that we would make some kind of project before they went home, I just hadn’t picked out a project yet. 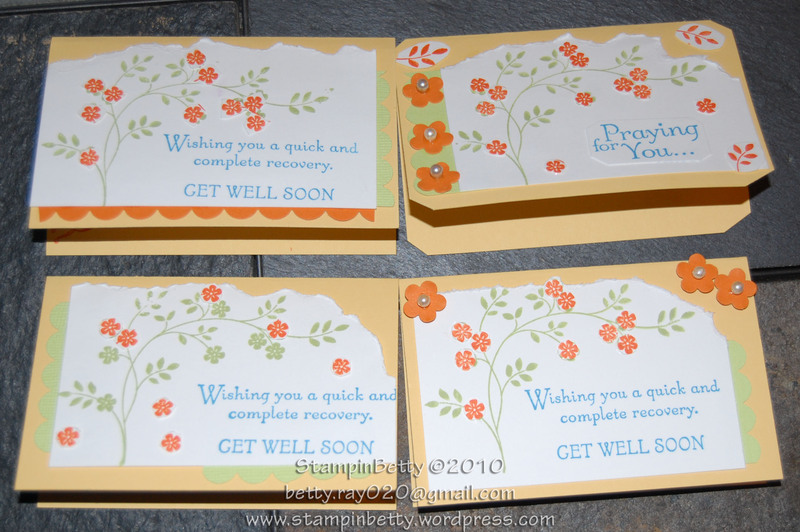 So when Tina happened to flip through my NEW catalog (yep, the non-crafter has seen the new catalog and you have not…hahaha) and mentioned that she thought this one little “get well soon” card was cute and would be perfect for her father-in-law who just had surgery, it was settled, we would all be making that card! 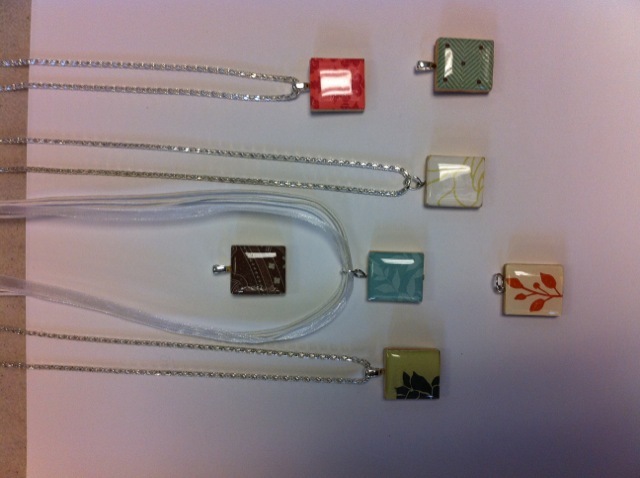 I love it when Non-Crafters think they won’t like stamping, and then after just one project they are ready for more!! 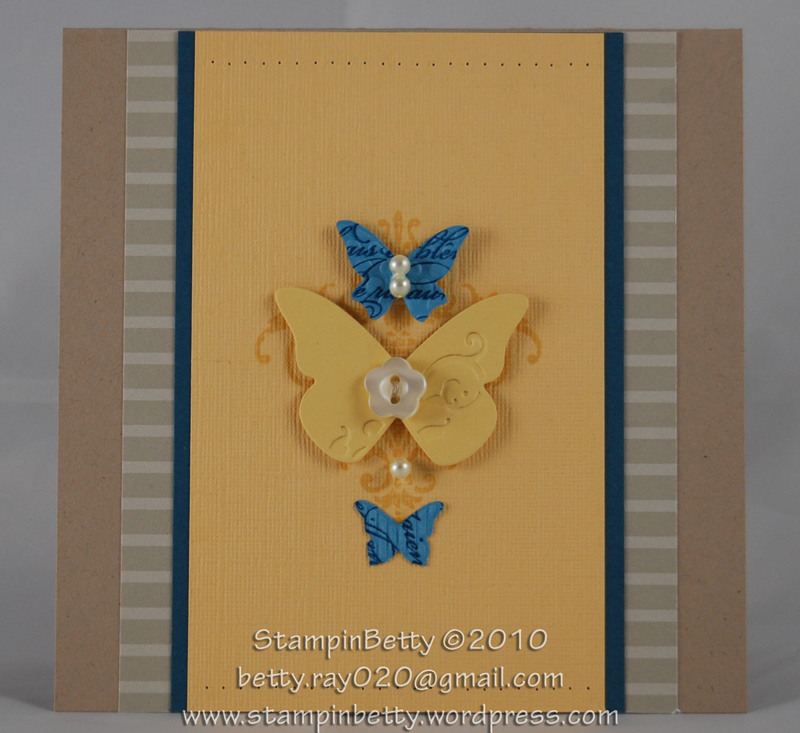 The card we made was a smaller card, and very simple, which was perfect since our group ranged in age from 8 to 32. 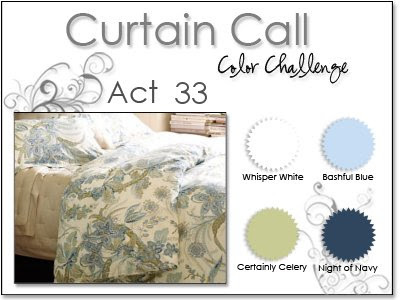 A version of the card we made can be found on page 150 of the brand new catalog (being released July 1, 2010). 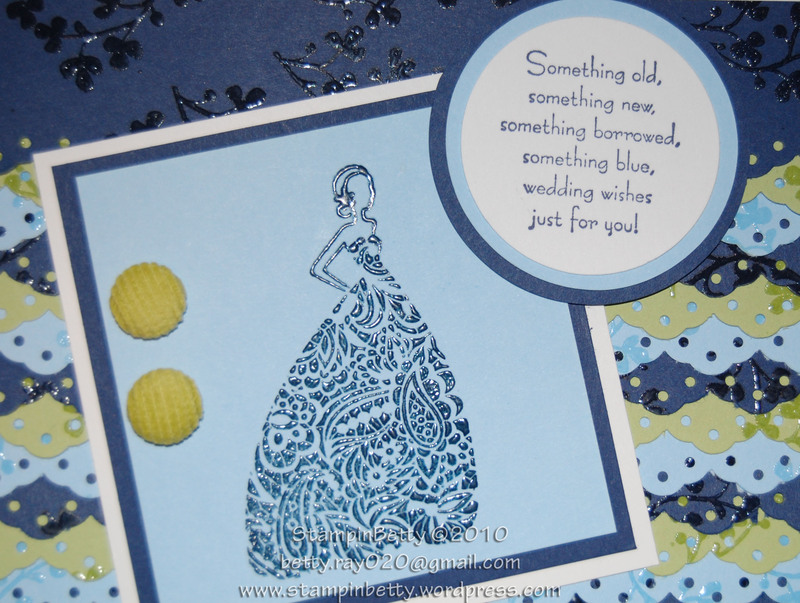 So this card also serves as a sneak peak to some of the things you will find in our new catalog. Can’t wait for another Crafty Girls Day!!!! Will be back soon with another post…..I have many projects finished and ready to go, I’ve just gotten so busy that I haven’t gotten around to posting them, so don’t worry, I am still going strong on my goal of completing 365 projects in 365 days!